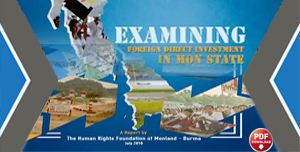 This report concerns local villagers in the aforementioned areas, 98% of which are Karen nationals and 2% are Mon and Burmese nationals. These local residents heavily depend on the income from their farms and orchards for their livelihoods while some, residing along the rivers and streams, work as fishermen for a living. 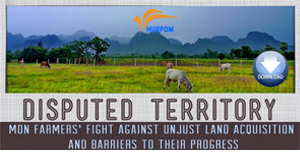 HURFOM has documented war crimes from ongoing war and armed conflicts happening in the following targeted areas: Karen State, Mon State, and Tenissarim Division. These are the areas where the government troops and Karen armed groups were active and engaged in fighting during HURFOM’s information-gathering over a one month period. It’s similar to the previous report about the breakout of fighting between government troops and a Karen armed group, which affected the lives of civilians where the conflicts took place. It also revealed that both sides, the government troops and the Karen armed group, harmed local residents by demanding military supplies, supporting fees, food supplies, and anything else their armies needed. 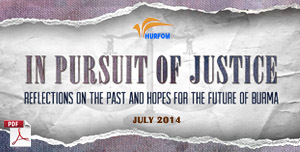 HURFOM’s objectives are to document and report on human rights violation cases in order to promote human rights and lessen the chance of future violations. HURFOM gathers facts about all human rights abuses and will report on these cases regardless of which armed group or army committed them. Therefore, where possible, this report includes the names of any and all armed groups and local residents that were part of the fact-finding. During a 25 day investigation, three HURFOM field reporters and their network of local sources gathered facts and stories secretly. Yet, as there were security challenges involved in collecting some of the stories/facts in the areas where the government troops are active, they failed to report on some other specific findings. 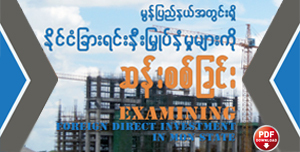 This report is only able to be written three weeks after the investigation, drawing from interviews and specific sources of 30 local families and some other local residents who provided facts from 12 villages under the administrations of 3 townships: Kawkareik Township, Kyon-Doo Township, and Kyarinnseikkyi Township. The cases in this report took place in the context of armed conflict engaged between government troops and battalions No. 901,902, and 908 of breakaway DKBA led by Col. Saw Lah Pwe in Kawkareik and Kyarinnseikkyi townships since last April until now. Because of the ongoing engagement between the Nay Pyi Taw government troops, with the help of its BGD troops, and Col. Saw Lah Pwe’s breakaway DKBA battalions, life is hardfor the local residents in Kawkareik Township and Kyarinnseikkyi Township. During battles, both of the armed groups, government troops and breakaway DKBA, demand local residents to provide them with recompenses for casualties or lost equipment, food supplies, and other supporting fees. The local residents who HURFOM spoke with had to take out funds from their savings, while some had to borrow to fulfill the demands of the armed groups. The instability in the region directly affects the lives of local residents. Residents often have to hide in bomb shelters to avoid the fighting. As long as the guns and artillery continue to fire, they are unable to work to earn a living. Even though our children are hungry, we have to try to provide for their demands rather than feeding our children. Sometimes, we want to feed our children the things that we give them [the armed groups]. [But] we’ll be punished if we have nothing to give them. And, we have to work for them as ordered when we only have our labor left to give. Becuase of how the war has affected us in this way, the word ‘fighting’ is one of the words that I do not want to hear. 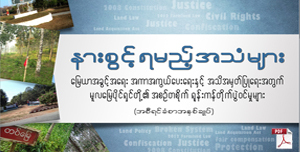 In this report, HURFOM has included the opinions of local residents over ethnic armed groups in its previous reports. The interviews HURFOM conducted with local residents also reveal the opinion of local residents over the current armed conflicts in Kawkareik and Kyarinnseikkyi Townships. Most of the interviews show that residents are still fearful of government troops and want no armed groups in their area. They are also frustrated to know that the rebel groups are the sources of the problems. According to the local residents, the breakaway DKBA troops are the primary sources of their troubles. “For me, I want none of the revolutionary groups to be stationed here. They may heroically call themselves a ‘revolution group’, ‘defense force’, and/or a nationality group. etc. [But] we are the people who have to provide for them while they pick our pockets. It’s okay if we have things [to give them]. [However,] now, even for our own survival, we are struggling. So we do not have goodwill [towards the armed groups ]. If there were no revolutionary groups, there would be less fighting. If possible, we want none of it; we just want to work for a living peacefully. It is said that the success and failure of a revolution always depends on civilians’ support. Every revolution requires sacrifices from civilians. These come in the form of financial support, supplies, and cooperation. A system of rules or a code of conduct is also necessary if these sacrifices are to be paid. Otherwise, it’s like extortion if sacrifices are demanded in accordance with no system of rules or without reasons, in addition to demanding to the point of starvation for the civilians. The findings in this report show that during the current armed conflicts in Kawkareik and Kyarinnseikkyi townships between the government troops and Breakaway DKBA troops, both sides have forced the local residents to provide for them without any system of rules to regulate their behavior. The battalion No. 908 of Breakaway DKBA, led by Major Sein Myint, with its followers, has continuously demanded supplies and support from local residents in two townships, Kawkareik and Kyarinnseikkyi.. They particularly demand financial backing, but they never give reasons or explanations for how they will use the residents’ money. Worst yet, they have already demanded supplies and financial support from the same villages many times and appear poised not to stop. Kawkareik Township – Yay Kyaw Gyi, Yay Kyaw Lay, Houng Taraw, Tayet Taw, An Kaung, Thone Set Thone Su, Kyaik Ta Lite, Dauk Phalan, Boh Taing, Naung Nine, Nang Shwe Mone, Tamine Gone, An Phat Lay, An Phat Kyi, Koh Nwe’, Yay Lae Gone, Myoe Houng, Ywa Tan Shae, Katoe Wa, Sakawet, Aung Hlaing, Mi Paline, Khutone, Sanpalan, Khutone Kanna, Asoon, Lan Phan, Kaw Sai, Maga Baw Si,Paing Kalar Done. [We have been] demanded to pay 200,000 kyat per month in Htee Huu-tan village, Kawkareik Township, and paddy rice 200 tin (baskets of rice). Years have passed by, how can we continue to provide? We have to borrow the rice from others after giving them our stored paddy rice. We have to just give it them like that to fulfil our ‘responsibility’. As Col. Sein Myint’s DKBA troops are stationed here, we would be punished if we do not pay them. We can do nothing as they are the ones who have the power. So, we just have to provide for them like this. According to a local source, because the breakaway DKBA troops have been demanding food and support recklessly, it seems that they are no longer faithful to those Karen people who have been supporting them for over 60 years — for the purpose of Karen national liberation. Local sources said that they were unhappy with the behavior of the breakaway DKBA, as they have abused locals just like the government troops have done. I don’t think any armed group should act like this if they really want to get support from civilians and fight for their revolution after they had abandoned their businesses. They ‘said’ they are protecting the people, and that they fight for Karen sovereignty for the Karen people. [But], they are breaking their promises. In my opinion, I see their demands as worse than the government troops’ tax collection. This is like what I’ve just said: they are destroying peoples’ confidence and beliefs in them. Despite those strong words, HURFOM reporters found that many Karen local residents are afraid to claim that the breakaway DKBA battalions levied them with unfair taxes for the purchases of their rations and armed supplies. It’s generally assumed or understood that it is risky for them to criticize the rebel armed groups, as some local people had already had bad experiences doing so. Thus, the main reason why local people do not call for justice when abuses are committed in their area is that they are afraid of repercussions from the armed groups. However, a general reluctance to admit guilt or seek justice in society has been common since the days when people lived in fear under the governments of the State Law and Order Restoration Council (SLORC) and the State Peace and Development Council (SPDC). According to an estimate provided by local sources, there are over 800 pay-for-use telephones operated by local businessmen in the two townships of Kawkareik and Kyarinnseikkyi, Karen State. Most of the phones were cordless phone types, and in order to operate, the phone operators had to pay taxes to local DKBA authorities, who are cooperating with Thai Tele-communication Company. It was revealed that prior to the nationwide elections and the breakout of fighting between the government troops and breakaway DKBA in early November 2010, there were three times as many phone service providers in the two townships as there are now. The remaining phone service providers operate only for remittances and personal use. Last July, those phone owners of remaining phone services in Kawkareik and Kyarinnseikkyi Townships who run their phone services but earn very little were saddled with heavy taxes from the breakaway DKBA troops. Some phone operators had to shut down their phone services because they could not pay taxes as demanded. We cannot even get 200,000 kyat – that’s the amount they demand from us – from running our service in one month. There are so many phone operation services. And, the number of people who come to [use the] phone [services] is gradually decreasing. Additionally, we also have to work for families’ survival and the expenses of taking care of the kids. The DKBA troops which come to ask for [money] are the troops from Battalion No. 908, led by Major Sein-myint. That was on June 14th, and they came to ask for it the whole week. After negotiating in various ways, we could get it cut down to 80,000 kyat. That’s just one group. I do not know yet which groups will come to demand again. The heavy taxes of hundreds of thousands of kyat from the breakaway DKBA battalions deeply affect the business owners running the phone services. Moreover, even though rates of service are only 300-400 kyat per minute, business owners said there are very few customers. When fighting erupted in this area, sometimes the government troops also imposed taxes on the phone service providers when they were planning a military operation. In short, phone service providers have been forced to pay fees to both sides of this conflict. 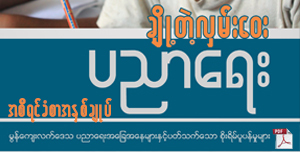 In the second week of April, the government columns of Light Infantry Battalion No.543, under Military Operation Management Command (MOMC) No.5, charged local phone service providers heavy taxes in Ah-sone and Lan-phan villages, when they were doing military operations in Kawkareik and Kyarinnseikkyi Townships. If I wanted to run a phone service, I had to pay taxes to both sides. And, because this was a communication business, if something [bad] happened, I would be accused of providing the information [for the enemy]. That’s by the time Thin-gyan [annual water festival] ended. I had already experienced this when the government LIB No. 543 came to our village. The Burmese soldiers accused me of being an informant for [breakaway] DKBA because I opened a phone service. And they confiscated my phone system. I also had to pay 300,000 kyat to them. That’s after I had already paid 80,000 kyat to DKBA as a monthly tax about 3-4 days prior. Because of this, without thinking about anything, I just shut down the service. I also became in debt. Due to the outbreak of post-election fighting between the government troops and breakaway DKBA brigade 5 and ongoing fighting throughout northern and eastern Karen State along Thailand border, there are thousands of people fleeing their homes to safer places. Hundreds of families have fled their home villages to Mae Tha-war village in Myaing Gyi-guu area, which is in Hlaing-boe Township, close to the Thai-Burma border. However, because there is no humanitarian assistance and there are no job opportunities in the area, the refugees have faced many difficulties. The refugees have many difficulties. Fighting breaks out every day in their home villages in Kawkareik Township and Kyarinnseikkyi Township. And, because of the fighting, they could not work and had to flee to here, the border. Now, according to our list, the villagers from 10 villages, in Hlaing-boe and Par-bon townships have also left their homes. Everyone, including village head, left to come here. This area is called Myaing Gyi-guu. Here, we have accepted over a thousand refugees fleeing from the fighting. For housing, they just have to live in whatever they can. It does not seem like the amount of food supplies and medical assistance was adequate for the number of the refugees. So that’s why we need to get international assistance. Additionally, because of the fighting in Yaw-po, Tha-wee Ka-lar, Ka Mar-htar, and Pa-nwe Thar-ka-lar villages, thousands of people from these villages, including the village headmen, have fled to Mae Tha-war village, Hlaing-boe Township, close to border. And they have still not been provided with humanitarian assistance. Also, according to an official from breakaway DKBA brigade No.5, because government Light Infantry Battalion No. 204, under Division No. 11, fired artillery shells into Mae-lar and Mae-seit villages, specifically in Htee Tha Taw-htar village ward, Par-bon Township, on 2nd August, the villagers from those locales have fled to Hlaing-boe Township, Myaing Gyi-guu area. We are not stationing in those villages anymore. We already drew back; otherwise, the cattle and buffaloes would eat up the paddy rice grown in the farms belonging to the villagers. If we kept deploying there, in the villages, the other side [the government’s Border Guard Force (BGF)] would continue firing into the villages. And it would destroy the houses of villagers. This happened in late July, when the BGF troops and Breakaway DKBA troops were engaged in fighting. The BGF were in an elevated position, firing guns and artillery shells into the villages. Some villagers in the area were wounded and a local school was shut down. It has yet to re-open. The post-election violence has devastated the lives of many who live in or around the battle zones. Additionally, the ongoing armed conflict has made it both dangerous and difficult for HURFOM’s reporters to get in and document the human rights abuses occurring each day. The human rights abuses, such as those documented in this report, are taking place throughout three townships: Kyon-doo, Kawkareik, and Kyarinnseikkyi. And they are committed by both government troops and battalions of the breakaway DKBA. The findings of this report show that civilians living in the affected areas have been the victims of extortion by armed groups. They are providing large quantities of rice, money (in the form of taxes and fees, and military supplies. Neither side of the armed conflict has held their soldiers accountable or practices restraint in their demands and ill-treatment of civilians. Their actions have led to extreme hardship for the villagers, who are unable to work and struggle to survive. Finally, many are reluctant or afraid to report the injustices in their villages owing to the climate of fear that has remained since the reigns of previous governments. Accountability and transparency are the critical deficiencies in these areas where human rights abuses are taking place. If the armed conflict does not cease, it is likely both sides will continue to extort and abuse civilians without restraint.. As such, the lives of local people will always be in extreme danger. Despite the transition to a supposedly civilian-led government, violence and injustice continue to occur in the country. 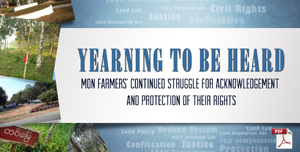 Consequently, armed conflict and human rights abuse are still prevalent. Therefore, it is a moral imperative for the new civilian government to make changes democratically and to start dialogues with all ethnic groups at once to end the fighting and bring about a stable peace. If they do no act, the people of Burma can only expect more of the same.